Today's custom wallpaper post will show you how you can use an image to create your very own penthouse view. Whether you live on the top floor or the ground floor, a custom wall mural of a city skyline can create the feeling that your space is high in the clouds. How else can you get a million dollar view of downtown Manhattan in your studio apartment in St. Louis? 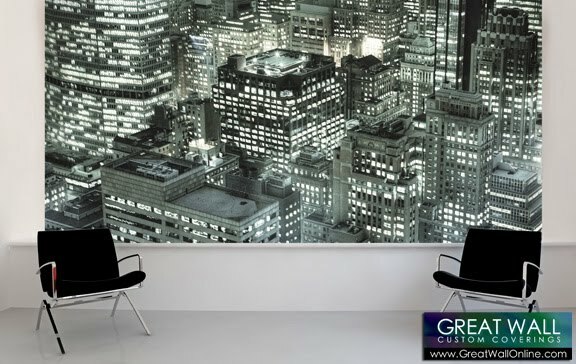 The above image in our inspiration room illustrates the concept: using the right image for a wall mural engenders your room with feel of living in a skyscraper. 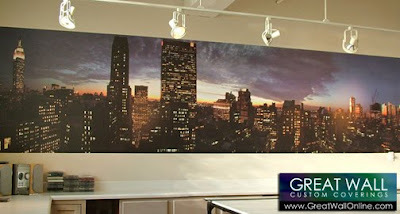 Another Manhattan skyline cityscape mural, more of an all-encompassing panoramic wall mural. This shot we've featured before, but again illustrates the possibility of decorating with a skyline view. 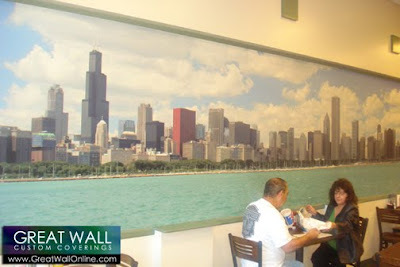 This wall mural showcases the skyline of Chicago as seen from Lake Michigan. Finally, one more image from our installations gallery from our website. 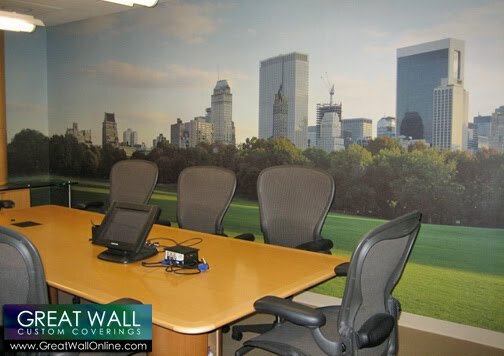 Again, we're using a cityscape wall mural, but as opposed to giving you the impression of being in a penthouse in the sky, you get the feeling of being being nestled in the middle of Central Park with the skyline of New York looming around you. Options abound when decorating your walls with custom wallpaper featuring a cityscape. Contact us to learn more.